Those of us over 40 know that staying fit becomes much more challenging with each passing decade. There is an unwelcome change in body composition that occurs with age – we gain fat and lose our muscle. 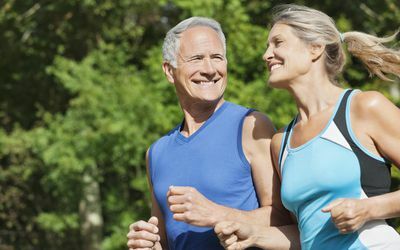 Age-related loss of muscle, known as sarcopenia, starts in our 40s and by age 50 it is estimated that even active people lose about 1% of muscle mass per year. The good news is that this process can be prevented and even reversed. In our teens and 20s staying fit is easier because there is greater balance between muscle building and loss, however as we age the equation changes and we start to deplete/lose more muscle than we build. Other factors that can be at play include stress, hormone imbalance and poor lifestyle choices. So what can we do about this? Well, I have three key strategies that can rejuvenate your muscles, improve your physique and keep you feeling stronger longer. Pump up Protein: Protein is essential to build healthy muscles. Aim to get at least 0.8 grams of protein per kg of body weight. Include protein with each meal and snack. Some of the best plant sources of protein include eggs, Greek yogurt, Edamame, peanuts, chickpeas, lentils, almonds, pistachios, and Spirulina. If you aren’t able to get enough protein through diet, consider a supplement. Add Essential Amino Acids: Amino acids stimulate muscle protein synthesis, which is the process by which our body builds muscle. Research on a specific amino acid blend called Rejuvenate has shown that it can rebuild and repair muscle even in those who are not exercising. Clinical studies suggests it can boost muscle protein synthesis by 57% and increase strength and energy. Move Your Muscles: Resistance training activities can help to build and maintain healthy muscles, boost metabolism, and lead to greater reductions in body fat. Aim for 20 minutes four times a week. Do exercises that tap into larger muscle groups such as push ups, squats and lunges. These weight bearing exercises also help to keep the bones strong and healthy.